There is much folklore about Eversholt pubs, and some misconceptions. Some published records seem to contain mistakes. This page and those for the individual pubs are an attempt to penetrate the thickets of misinformation. This page is just an overview describing sources, while the individual pub pages go into more detail. From 1830 until at least 1869, there was a distinction between a pub, licensed to serve spirits, and a beer house, licensed to serve only ale. It’s explained at Wikipedia. Opening a beer house was very easy, so it’s likely that some of the “pubs” in Eversholt were actually just people’s homes licensed as beer houses. Beer houses in use in 1869 could continue as beer houses indefinitely, although some did convert to pubs. No new beer houses were created after 1869. The 1765 Map and Field Book. 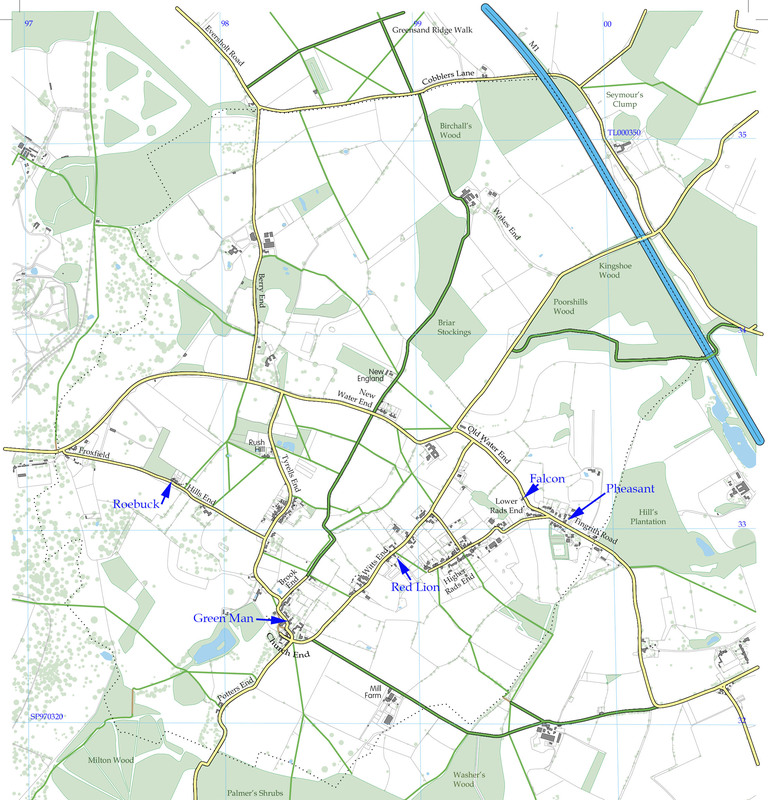 The Field Book is a handwritten document telling who owns which property marked on the map. Very comprehensive! The 1806 Enclosure map and Field Book. Again the Field Book is (as well as a complicated legal document) a list of who owns what. The quality of the map is not as good as the 1765 map. Trade Directories from 1847 on. Frustratingly, the trade directories give no maps, no street numbers, and often no house names for the pubs. When directories were popular, pubs were divided into Public Houses (licensed to sell all alcohol) and Beer Shops (licensed to sell only ale). 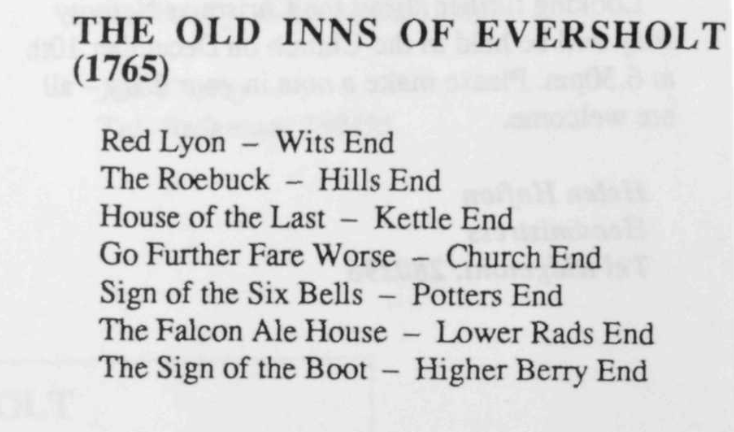 The practice in the directories seems to have been to list the names of only the public houses, and to list the beer shops only with the name of the road and the proprietor. This applies even for beer shops that have been long established, such as the Six Bells. Further confusion occurs when a proprietor moves from one establishment to nother, which sometimes happened. Newspapers from the wonderful British Newspaper Archive. Clippings are reproduced here, but you can see the full papers in glorious detail for free at Bedfordshire libraries. Census data from Ancestry.com. Again, this is available for free at our libraries. Here is a version of the Parish path Map annotated with the position of some of the pubs. Exactly which house was The Pheasant isn’t clear, but it is one of the buildings in the plot marked. Click for a much bigger version. There have been, at one time or another, many public houses in Eversholt. About Eversholt records a list dating from 1765, and Kelly’s Directory records others. We already have the sources for these lists here. The 1765 document has to be the Field-Book associated with the 1765 map. And the Directories are mostly available here too. Odds and Ends alleges that there was a pub named The Swan listed in the 1910 Kelly’s Directory. I have to say I can’t see a Swan at all anywhere in that listing, so I think this is imaginary, I’m afraid. There is quite a bit of confusion about these various lists, so it is worth trying to correct some misunderstandings. In this table, the “section” and “No” columns refer to the index numbers marked on the 1765 map. “ARP” are the land area in acres, rods and perches. It’s not clear where the “owner 1795” data comes from. 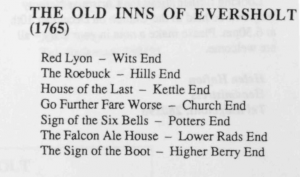 Only two of these are unequivocally listed as pubs, the Falcon and the “Go Further and Fare Worse”. The others, although they have signs traditionally associated with pubs, are not really clear. Even one of those had “formerly sign of the Last” so may have ceased to be a pub in 1765, if it was one earlier. For more details on all of these, please see the subpages.